With the Winter portion of Santa Anita's 47-day meet concluded last Sunday, jockey Joel Rosario topped Flavien Prat by a 56-52 margin, and will be recipient of Santa Anita's coveted Golden Whip Award. 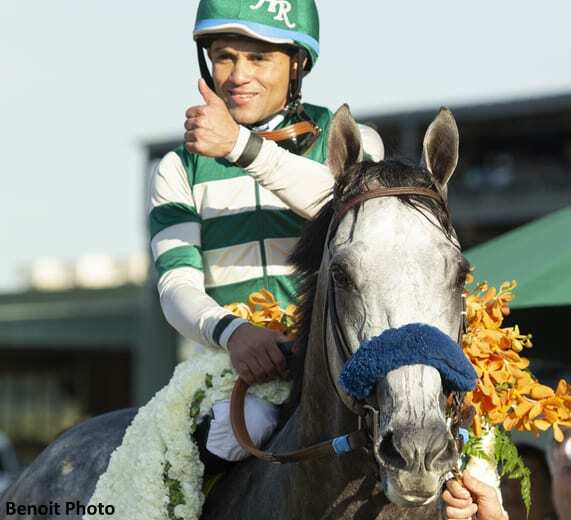 Rosario, 34, capped his successful run with victory aboard the John Sadler-conditioned Gift Box in the 82nd running of the Grade I, $600,000 Santa Anita Handicap last Saturday. A native of the Dominican Republic, Rosario was also Santa Anita's Winter Meet leader in 2011 and 2012. Prat, a 24-year-old native of Melun, France, led all jockeys in the stakes-won department with 12 added money victories, four more than Rosario. Doug O'Neill, 50 led all trainers with 29 wins, four more than Sadler, who had 25. O'Neill also led conditioners in 2005, 2006 and 2007 and thus collected his fourth training title. Hall of Famer Jerry Hollendorfer enjoyed another solid meet, as his stable registered seven stakes wins, including a victory in last Saturday's Grade II, $200,000 Royal Heroine Stakes with Vasilika. Hronis Racing, LLC totally dominated the owners' division, both by races and money-won. With 18 wins at the meet, it finished 12 wins in front of both Reddam Racing, LLC and Nick Alexander. In the money-won category, Hronis Racing amassed $1,325,015 in earnings from 64 starters—double Speedway Stable LLC's $642,245. This entry was posted in People and tagged doug o'neill, flavien prat, golden whip award, hronis racing, Jockeys, joel rosario, santa anita park by Press Release. Bookmark the permalink.